Thank you CSMAF Cody, finally someone with some common sense making decisions. 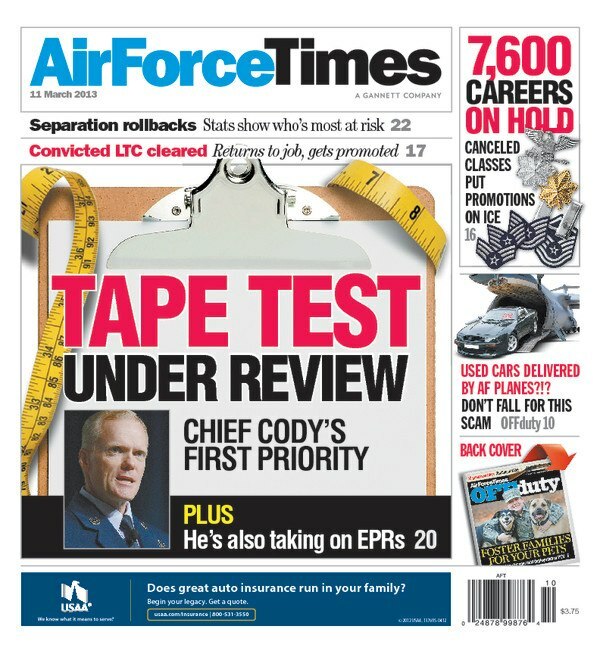 The waist measurement being use as a component for the Fitness Test and having such an impact on Airmen’s career is wrong. The waist measurement is an indicator of health not fitness. Just like dental and immunization. You can deploy if you fail a Fitness Test; however if you have a class 3 dental or not the required immunization you cannot. If you fail the Fitness Test at a bad time like right before your EPR closes out, you get a referral EPR. Which can turn off oversea assignments and make you ineligible for promotion; however if you get put on a class 3 dental nothing happens. Both waist size and gum issues can cause heart issues and other problems, and both affect your appearance. So if you are given referral EPRs for not meeting the standard for PT, why are not also giving referral EPRs for not meeting the dental standard and keeping up with required immunization. I would think for world wide quaified (for both deployments and PCSs), health reasons, and health insurance reasons you would be just as concern with the dental as the waist. Both are the individual’s responsibility. If you are not taken care of your teeth and gums, it is the same as not taken care of keeping a small waist. A standard is a standard and they all should be treat with the same consequences. Remove the waist component for the test and place it where it belongs with other health care issues like dental and immunizations. Let the PT test the physical components. Music to my ears. I did the 50 situps in a min, 57 push-ups in a min, ran the mile and a half in 13:41; all passing scores. However; i came in with a 38 in waist because i’m built like a damn tank and due to this i didnt obtain the points needed. Yes, i passed all four cat’s but failed the damn over-all test. PRICELESS!! !